Excellent facilities, highly professional staff and great location . The interior design is amazing. 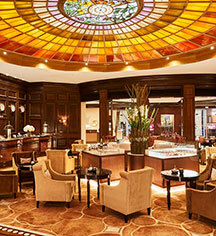 Cigar lovers will enjoy the unique cigar shop and loungh with very appealing prices . One of yhe best hotels i have been in. Thank you so much for your amazing rating - we are all delighted that you enjoyed your visit so much. We do try hard to make our guests feel at home so it is very rewarding to know how much our guests enjoy themselves. A truly lovely hotel located very centrally. Can not fault this hotel. Everything is absolutely wonderful. Excellent location, beautiful building, first class service. The only slight downside is probably the rooms are on a small side. But that's all. Other than that all really good. Thank you so much for your highly appreciated rating - we are all delighted that you enjoyed your visit in Munich. It was our great pleasure to welcome you as our guest. We do try hard to make our guests feel at home so it is very rewarding to know how much our guests enjoy themselves and will make sure to pass your feedback on to our team. We hope to be able to welcome you back very soon and remain at your disposal. This hotel was a great find. The location is superb, the staff is super friendly and the breakfast is delicious. The suite is spacious with ac, even during winter, the furniture is modern, the wifi is superfast and the tv has a wide range of channels. One thing worth mentioning is the japanese toilet seat, at the beginning it felt weird but then it became fun to use and quit helpful. If i would suggest something, it would be to improve the quality of the complimentary water, it was difficult to swallow for my personal taste, and we had to spend cover 80EUR on water bottles from a close by cafe. Despite that, it was the perfect hotel and i can't wait to stay there again. Thank you so much for your highly appreciated rating - we are all delighted that you enjoyed your visit. It was our great pleasure to welcome you as our guest. We do try hard to make our guests feel at home so it is very rewarding to know how much our guests enjoy themselves and will make sure to pass your feedback on to our team. We hope that you had a safe journey back home and I would like to sincerely apologize for the inconveniences you were faced with regarding the taste of the complimentary water in your room. Please rest assured that we will take your feedback very seriously. We have already addressed this issue to the respective department head. It would be our pleasure to welcome you back to the Hotel Vier Jahreszeiten Kempinski M?nchen in the not too distant future. My daughter and I had a very pleasant experience at this hotel. Our room was spacious and comfortable. Easy walking distance to many tourist attractions. I am surprised by recent negative reviews about the service there because it seemed quite good to me. Both the desk staff and concierge were helpful and gave us good tips to make our stay more enjoyable. The restaurant is being renovated so I cannot comment on that other than room service was good and served on time. The gym is small but when I visited it only 1 other person was there each time (you enter through the spa and have to ring the bell for the pool attendant to get to the gym). My daughter enjoyed her spa treatments while there. Thank you so much for your highly appreciated rating - we are all delighted that you enjoyed your visit that much. It was our great pleasure to welcome you as our guest. We went for breakfast at the Kempinski despite the fact that there was a good one ready for us in the morning at our own hotel because I wanted to try out this hotel for our next trip. I also confirmed that the website mentioned that a buffet breakfast was available for the said price per person. I arrived at 8.28am on Saturday, 16 February and a timid and mute, young Chinese girl who was the wait staff did not want to speak to me. Instead,she referred me to a small old lady whose face was fixed to a piece of paper to check room numbers I assume. She tore her face away from the paper and booth simply to say "No" to me and refuse my entry into the breakfast room. I did not want to argue so early in the morning about her blatant lie that the breakfast room was full when I could see the empty tables in front of me. I could also easily picture these friendly, chatty and agreeable people being replaced by an iPad and a gantry barrier. The vibe of the place was not for anyone who did not belong in the 1940s, men in stuffy suits, women simply invisible. This is a hotel for certain type of businessman and certainly is very unwelcoming for anyone living in the modern, present-day. sincere regards from the Hotel Vier Jahreszeiten Kempinski Munich and thank you for sharing your constructive and detailed feedback with us! We sincerely apologize for the inconvenience caused. I'm afraid that due to high occupancy and the Munich Security Conference on the weekend of your visit, we were unfortunately not able to accommodate you for breakfast. Our breakfast offer of course also applies to guests who are not staying with us. However, during high occupancy we unfortunately must limit the number of external guests to always ensure highest quality of service at all times. To avoid any disappointment we encourage our guests to call in advance for reservation. 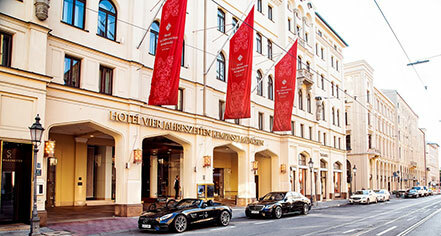 Our company and in particular the Hotel Vier Jahreszeiten Munich is known for it's great service and warm hospitality and we deeply regret that we did not prove so during your visit to us. We kindly ask you to accept our apologies and sincerely hope to welcome you back in the near future again. For any queries, I remain at your fullest disposal.